Yesterday, Saturday November 24, was such a big day for me. I headed to the mountains for the first time in 4 weeks to figure out this winter hiking thing. I’ve hiked in the winter and snowshoed but not a big mountain and definitely not a 8 mile 4,000 footer. I’ve read all the books about mountain rescues and being safe in winter. I had all the gear I needed and watched the weather fanatically. 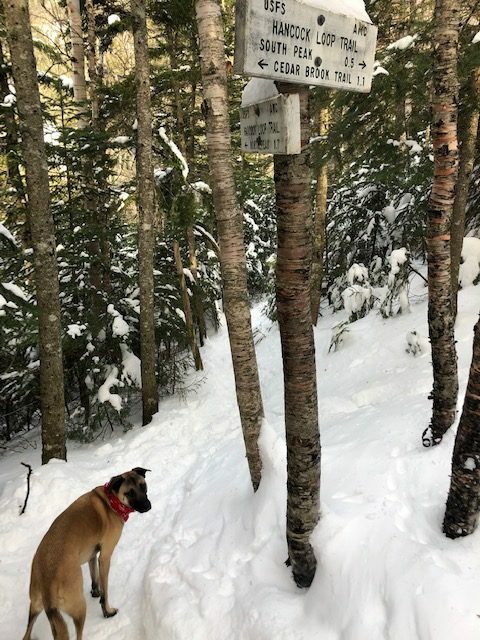 All signs pointed to a good day to hike Hancock North. In reality I didn’t set out to hike to the top. 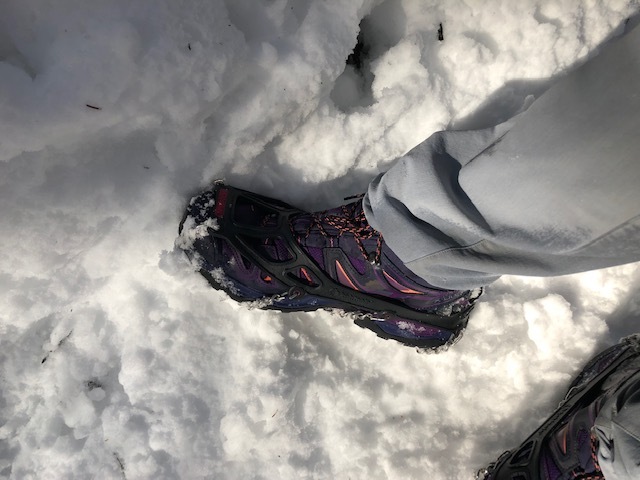 I wanted to scope it out; at least make it to the trail junction of North and South to see what the trail was like and to test out my snowshoeing skills and try out my spikes. I’d never used spikes before. The day’s temperature started out in the 20s and not a cloud in sight. 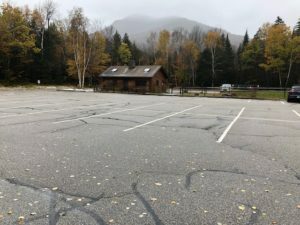 The parking lot for the Hancocks was almost full (a good sign that people were on the trail, I wouldn’t be alone). I saw that the trail from the parking lot to the trail was packed so I decided to leave the snowshoes in the car. 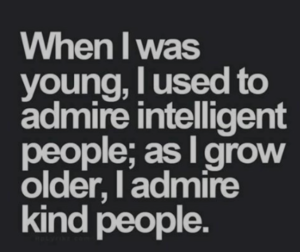 I could alway turn back if I needed them. The start of the hike on Hancock Notch trail. 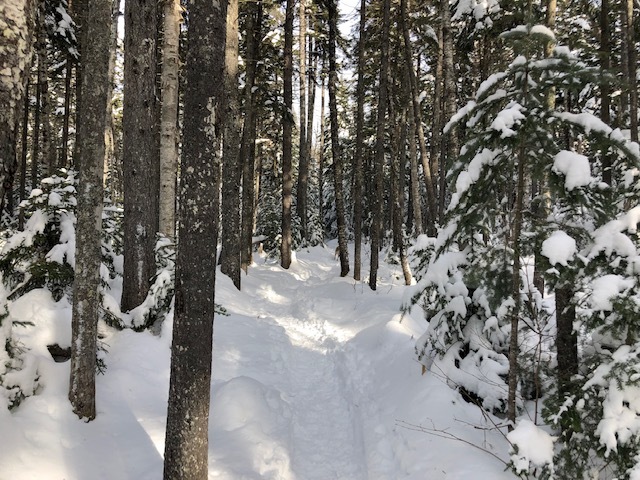 The trail was fantastic; hard packed and I seemed to be following someone wearing snowshoes. I knew this trail pretty well since I’ve already hiked it twice to South Hancock in September . In winter it was glorious. The river crossings were easy. The first trail junction. 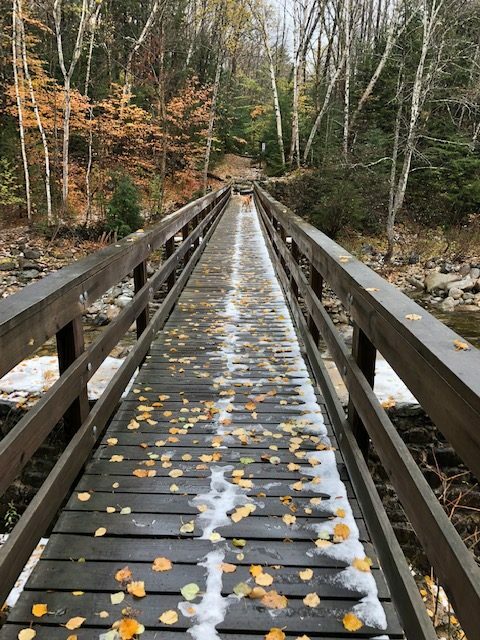 Let’s keep going to the loop trail. The snow was falling off the trees and crashing to the ground; sometimes loud sometimes softly. The snow falling to the side of me and behind me was creepy at first because it sounded like someone was following me in the trees, but after a while I got used to it. Water crossings were pretty easy. 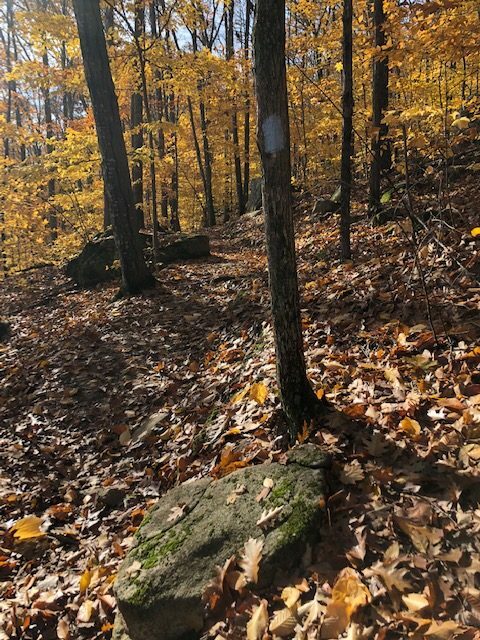 I remembered this one from hiking in the fall. After the last main water crossing, shortly before the first junction I met a man coming down from the peaks and chatted with him a bit. I noticed on his watch that he was at 3 hours 11 minutes and he did the loop – that guy was fit. He mentioned my hat, my Leadville Race Across the Sky beanie, and asked if I did it. I said it was my dream. He had raced it and was signed up for the coming race. Two years I said. Two years. I will do it. It was the first time I said it out loud. I met a solo woman hiker coming down from South Hancock and another solo man passed us going up as we chatted. With all the people out there and the trail being well marked, I thought I could make the summit. So at the trail junction Winnie and I headed for North Hancock. We decided to head to North Hancock. Conditions were great – let’s give it a try. The trail got pretty steep about ten minutes from the junction and someone had slid down it, wrecking the trail. I encountered a second hiker actually sliding down. I didn’t have the heart to say she was wrecking the trail; she knew it but did it anyway. The spikes helped me from falling backwards and I had to take a few breaks to catch my breath. Then Winnie came running back to me and jumped on me and licked my face, which she never does while hiking. We stopped for a break: water and treats. Then started again. I’m sweating bullets, the views are starting to get good and she runs back again, jumps up and licks my face – it’s time to turn around. Something happened to her or it was just too much – I don’t know but I wasn’t going to force it. We turned around, 0.2 miles to the top. The hike down was tough. I fell a lot and slid a lot and stepped off trail a lot. It was a bit nerve wracking when I stepped off trail and my leg disappeared in the snow. We made it back to the junction and I realized how warm it got. My spikes were clumping and I was still sweating going down. It was a tough hike that I know I have to do again shortly. But you know what – I love winter hiking. It’s so quiet and peaceful. There are less people. 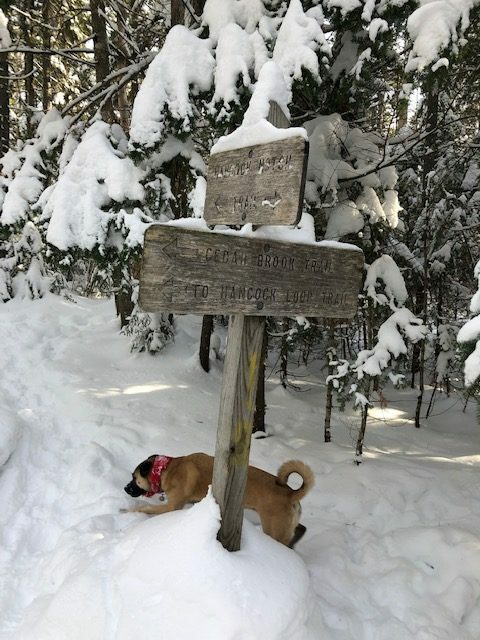 It was wonderful to follow a trail in winter and know exactly where to go. 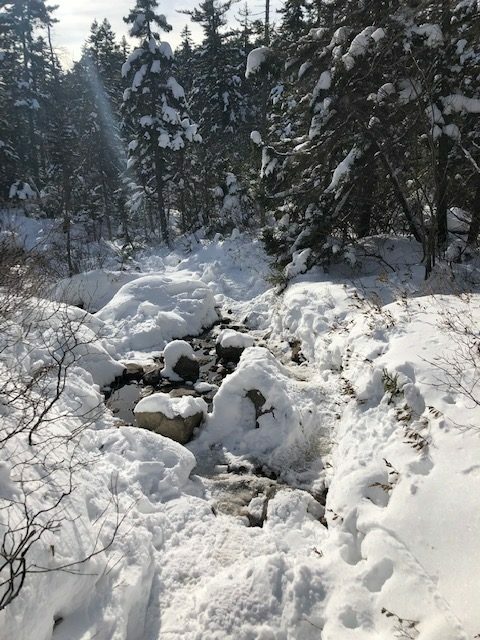 The snow made my pace slower so I took in the scenery more than summer/fall hiking. 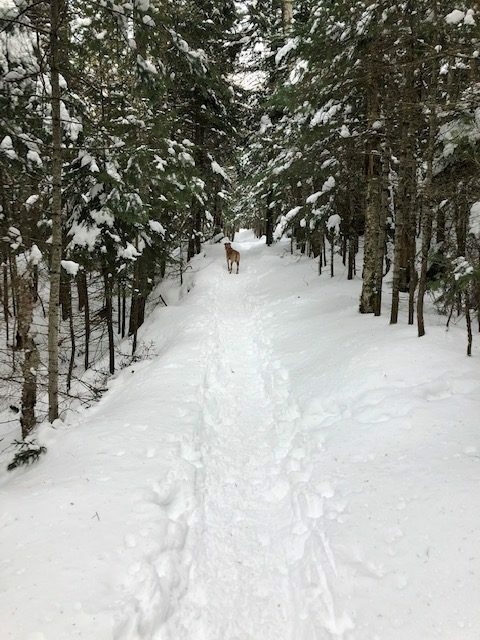 I was so much more calmer winter hiking; I wasn’t in such a rush. I can’t wait to hike when I need my snowshoes. I’m excited about this new hiking option! Since this is the fourth time through Lincoln to do the last hikes of the 4,000 footers I have started a bit of a routine. 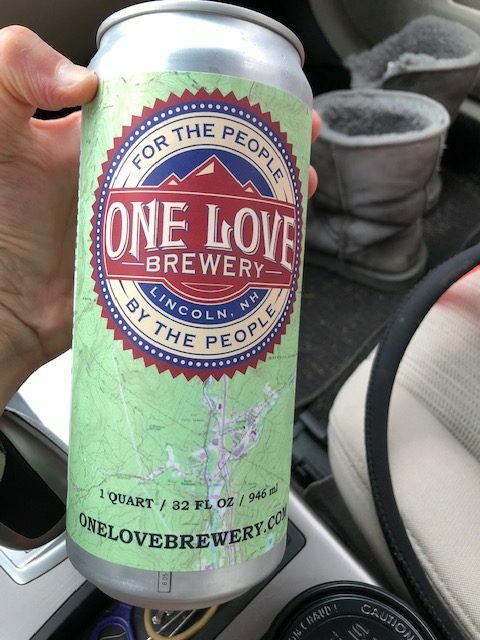 I stop at Half Baked for a latte and then the One Love Brewery for a take home beer. Today, I changed it up a big and got the latte but instead of the beer I stopped at the Mountain Wanderer. 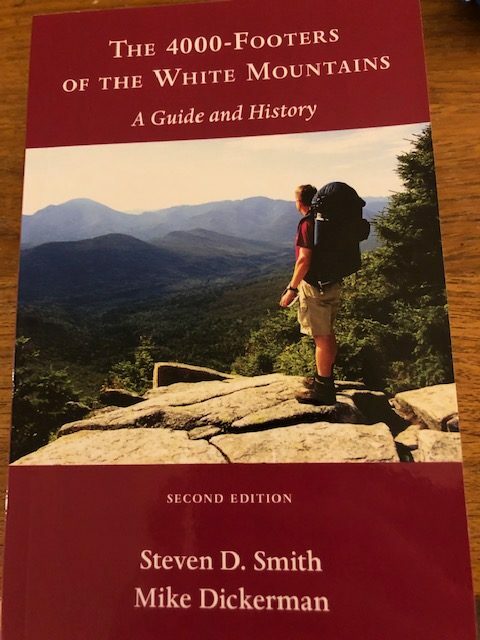 I’ve been reading Steve Smith’s blog and have checked out his book, The 4000-Footers of the White Mountains from the library. It was time to buy the book and marked it up so I remember the hikes. Plus, each mountain has a section about hiking it in winter. I asked the man behind the counter if he was the author and he was! We talked for a while about winter hiking, Owl’s Head, Hancock and Winnie wanting to turn around. 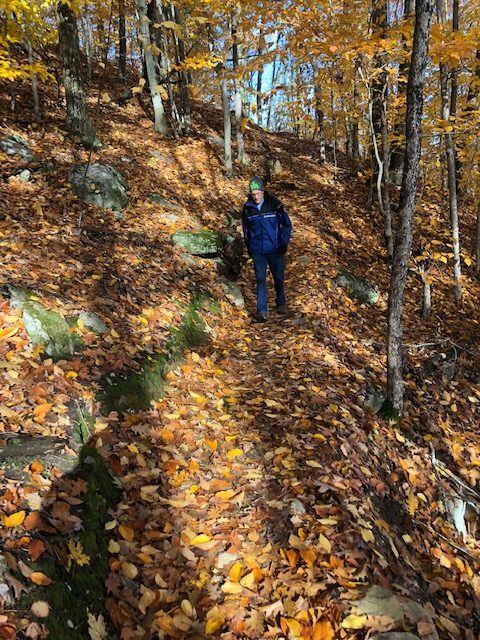 Steve motivated me to try the bushwhack trail to Owl’s Head since it will have a nice packed trail soon. He told me the story about Brutus the dog who has a bushwhack trail named for him. It was a wonderful, informative conversation; I was psyched to buy his book directly from his store. He was a wealth of knowledge and so kind. 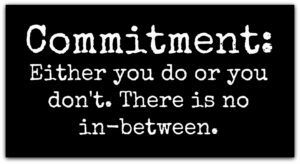 Training for my 2-year plan starts today. 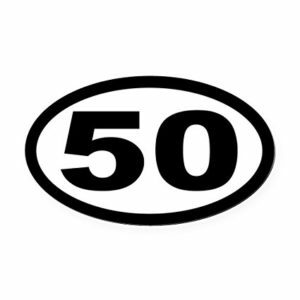 I will finish the 4,000 footers. 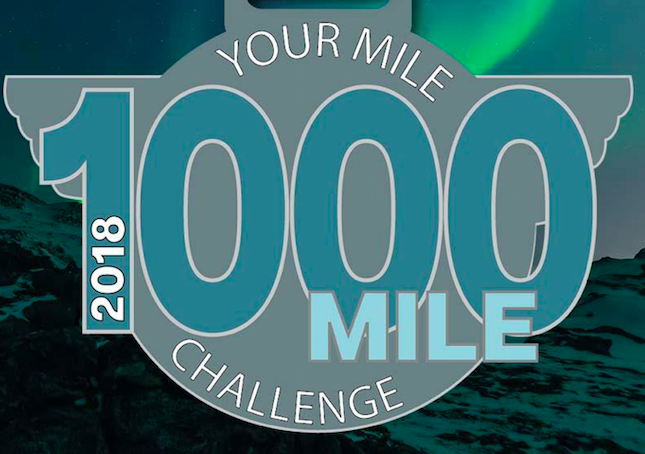 I will run/hike 1,000 miles. 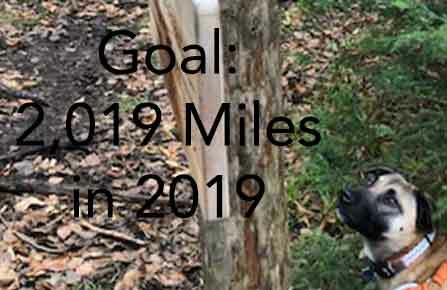 I will run a 50 miler in 2019 and I will run a 100 miler in 2020. Mark and I headed north on Saturday in the wind and rain. He was interested is seeing covered bridges. Here is one of the more famous ones: Jackson, NH covered bridge. 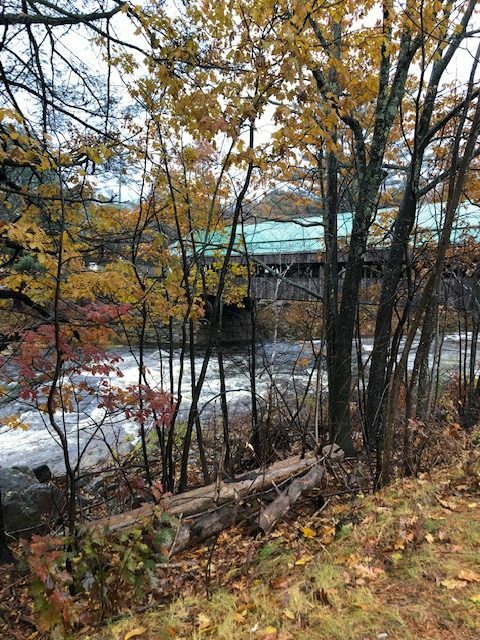 We were seeking covered bridges and found this famous one in Jackson, NH. 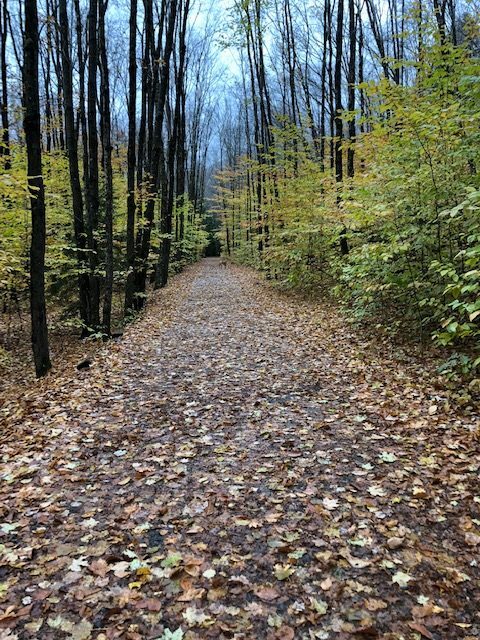 On Sunday, the best weather day, we hiked on my favorite trail: Marjory Swope Park trail in Concord. One of the momentos from our our trip north is a pint glass from a restaurant we stopped at in North Conway. It the Tuckerman Brewery glass below, third from the right. I realized all the glasses and mugs I’ve accumulated over the years remind me of some fun times all over the country. Pint glasses (from the left): finishing the Houston marathon 2017, 2nd place sprint triathlon finish prize Tucson 2014, Pemberton 50K trail run finisher prize 2013, Tuckerman Brewery Conway NH 2018, visit to Mississippi 2013, Tucson dog benefit 2105. 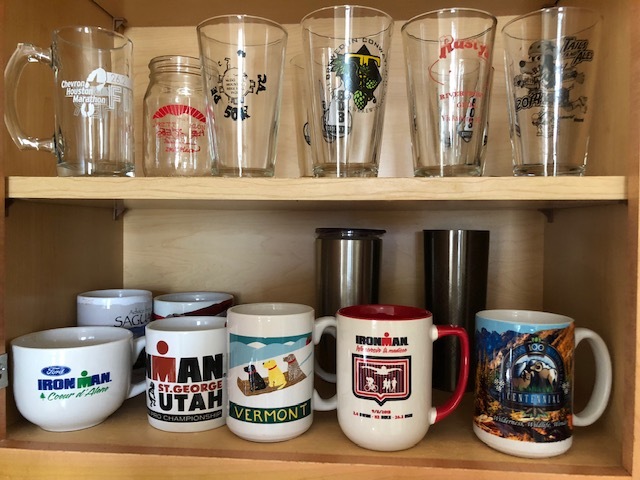 Mugs (from the left): 2009 1st Ironman mug, 2016 second St. George 70.3 race, a mug from my time living in Vermont 2001-3, Ironman Wisconsin with Mark 2013, my Christmas present from George from Rocky Mountain National Park. Such great memories of time spend in mountain and Ironman towns. 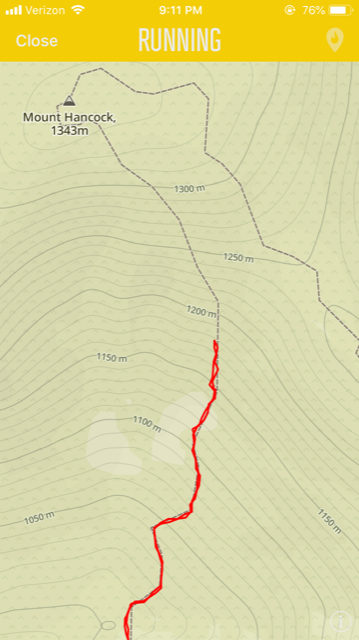 I have just two 4,000 footers left and I hope to hike them before the new year. 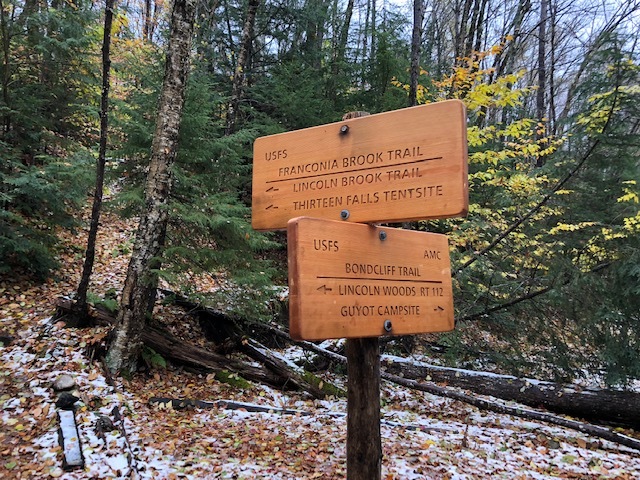 I’ve been reading the trail conditions report every day and there are several hikes reported to North Hancock so that one I think will be finished this year but Owl’s Head is just such a long day. I’m not ready for a winter camping in the Pemi Wilderness quite yet, but maybe. Maybe. There is still time to get the gear and practice using it. I have some visitors this month so I’m not able to get out there to try Owl’s Head again. But it will happen. My visitors are coming north from Texas and Arizona. I’m glad it’s not too cold, yet. This weekend Mark and I will head to Conway and check out some waterfalls and Mount Washington. 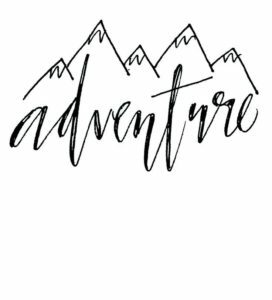 Next weekend Kassandra and I will find an adventure somewhere north in the White Mountains. Happy, Happy November. I picked up the local newspaper when I was in Lincoln on Sunday. In it I read an article by Tom Ryan about hiking with his dog Atticus. Ryan said that hiking is not about bagging a peak and heading back down. 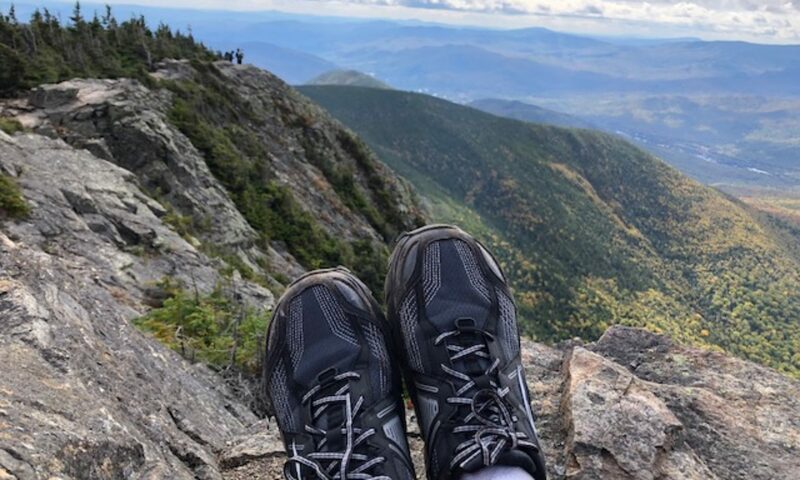 Hiking is about the journey of getting to the top and somehow finding your way home. It’s about being somewhere that isn’t as safe as your living room. 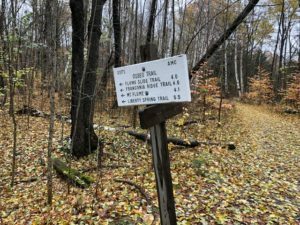 The article reminded me that every time I am about 5 minutes from a trailhead I’m scared. As I get closer to the start I get really nervous about getting lost, kidnapped, killed. All the irrational fears appear. Maybe not all irrational because I do watch, listen and read the news. All my outdoor activities take me out of my comfort zone. 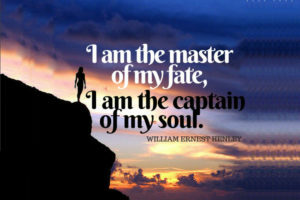 Not knowing the outcome is hard for a control freak – and let’s be honest – we are all control freaks. 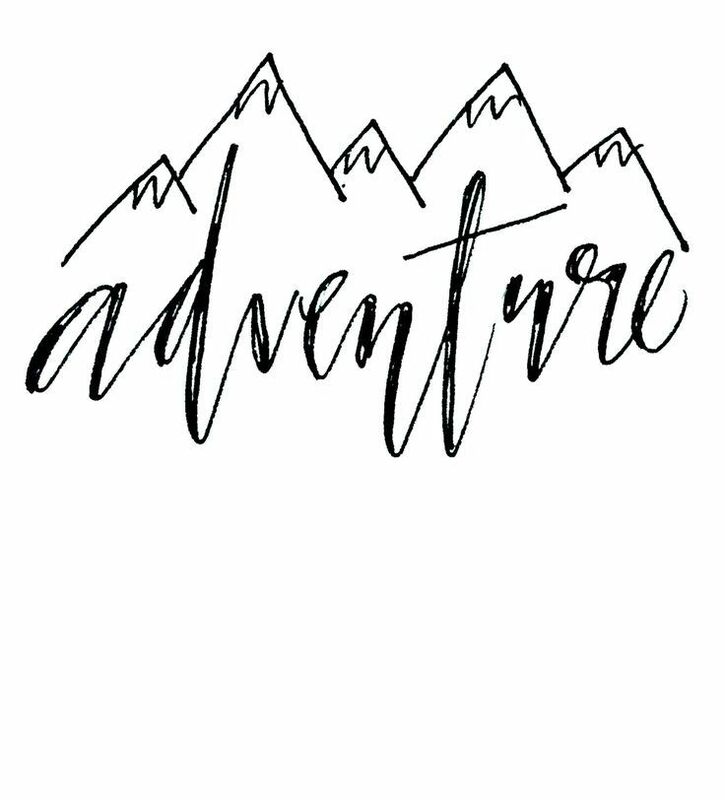 I always forget about that fear as I’m planning the next hike. 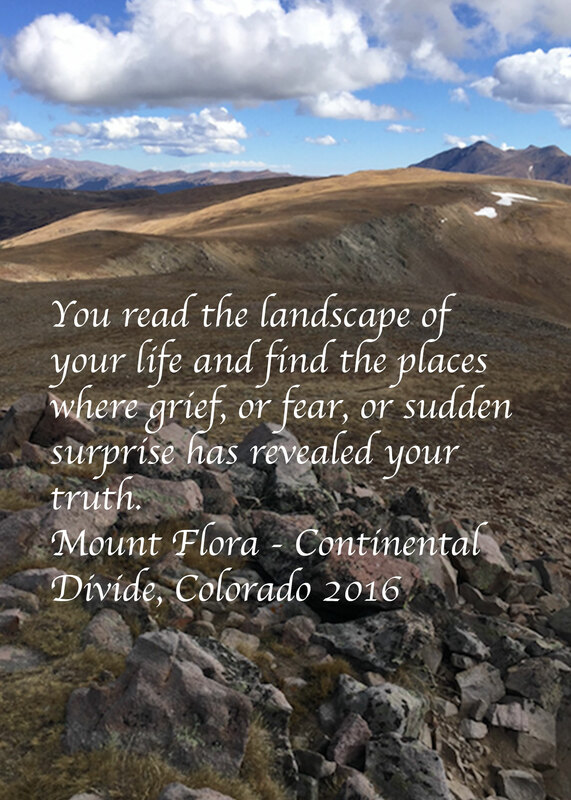 The feeling is similar to fear I have prior to flying and traveling to a new place; thinking of all the bad things that could happen. What I like about Tom Ryan’s article is how he loved the end of day when he was simply exhausted and fell asleep getting ready for bed. That is a great feeling. At the end of Sunday’s hike, that didn’t result in bagging another 4,000 peak, I stopped at the One Love Brewery. I’ve been meaning to go there just because I love the name. They can your choice of beer behind the bar. I chose the Octoberfest beer. After hiking for 12 miles hike with my dog on a trail that meandered into a wilderness, I got home safely, I enjoyed a One Love beer and fell asleep exhausted. It was a good day. Sunday we took to the wilderness. 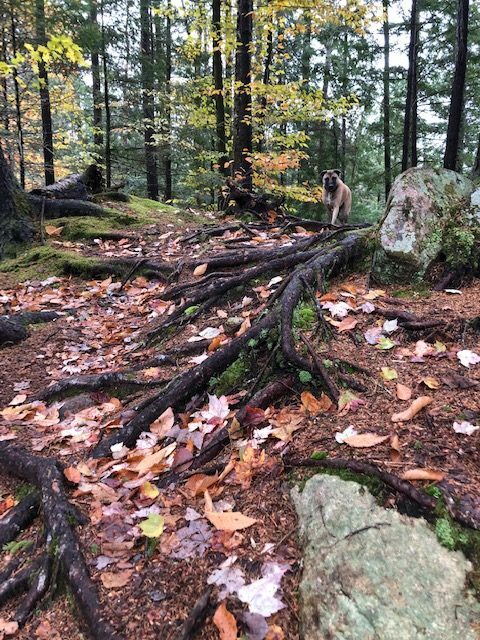 We didn’t quite make our destination of Owl’s Head but the journey was filled with rivers, rocks, roots and beauty. Must be winter. The Lincoln Woods Parking Lot is normally overflowing. Into the Pemigewasset Wilderness we go. Next time we will try this trail up to Flume. Another bridge, another river crossing. Side trip on Black Pond Trail to Black Pond. I loved the colors and the big roots. 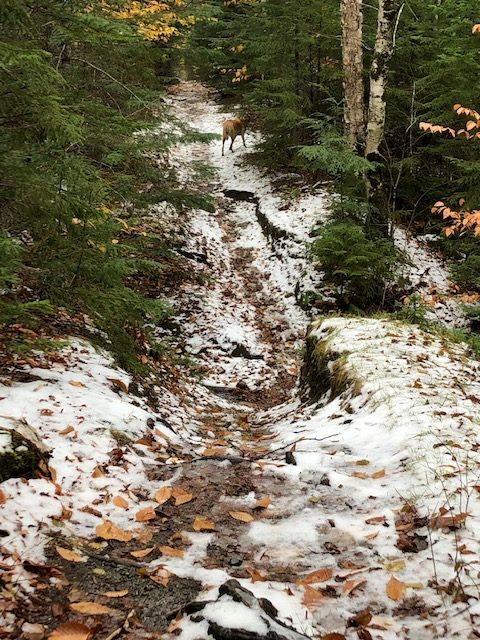 As we got off the Lincoln Woods Trail and onto Lincoln Brook Trail we saw more snow. 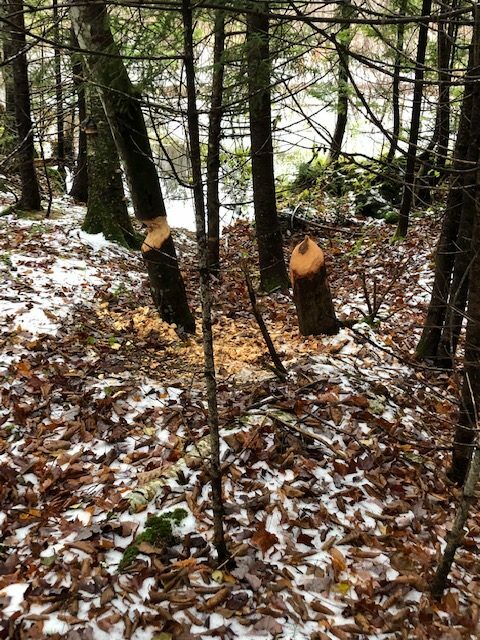 The beavers on the Franconia Brook Trail have been busy.